Courtesy of Storm Brewing Ltd.
What were you guys drinking this weekend? Some bargain basement barleywine? Pffft. It probably didn’t even cost $20 a bottle. And it certainly didn’t cost $1000 a bottle like the new (and super limited) Glacial Mammoth Extinction from Vancouver’s Storm Brewing. Owner James Walton brewed up a strong sour and then went on to freeze it twice at -30 Celsius. He froze it twice because he just couldn’t produce a beer as strong as he wanted it the first time. Then he took the sweet, boozy liquid he extracted from the ice and stored it in French oak for two years. The resulting brew, he says drinks much more like port than anything else—and at a potent 25 percent ABV, that seems quite likely. While the brewing process is certainly labor-intensive, the Glacial Mammoth owes its hefty price tag, to its unique bottling. 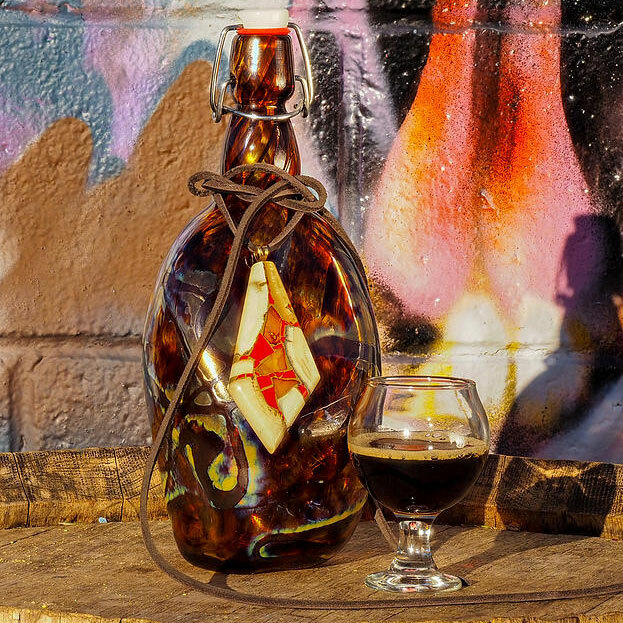 Storm is only selling 10 bottles, each individually blown by local artist Brad Turner and comes adorned with a pendant, from another artist Richard Marcus, made from the ivory tusk a prehistoric mammoth that the brewery says are close to 35,000 years old. The $1000 a bottle cost puts the Glacial Mammoth Extinction in some rarified company with respect to the world’s priciest beers. In 2010 the Scottish brewing iconoclasts from Brewdog sold bottles of their 55 percent ABV End of History in bottles made from taxidermied stoats (like a weasel) for $765 and Nail’s Brewing in Perth, Australia made a pale ale with water from melted Antarctic ice that sold for over $1800 at auction. The ancient mammoth tusks though make the Storm bottles particularly distinct. For those who don’t feel like spending their January rent money on a bottle of beer, Walton will pour some his strong sour at a more affordable price: one liter growlers are $80 and one ounce tastings are just $5. You’re on your own as far as digging for mammoth tusks though.